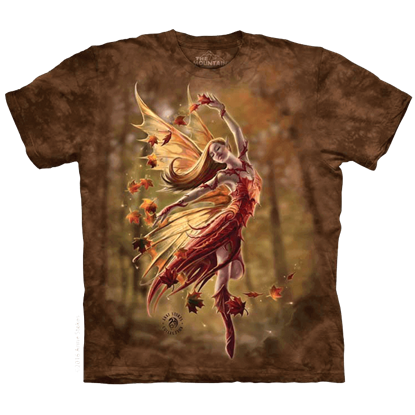 Be reminded of the crisp, cool air of fall with the Anne Stokes Autumn Fairy T-Shirt. This tiny being moves gracefully through the forest, sending swirls of magic that turn the green colors of summer into the amber shades of fall. Ushering in the soul of the figure resting beneath the rippling pond, this dark fairy kneels on the shore beneath a glowing moon. 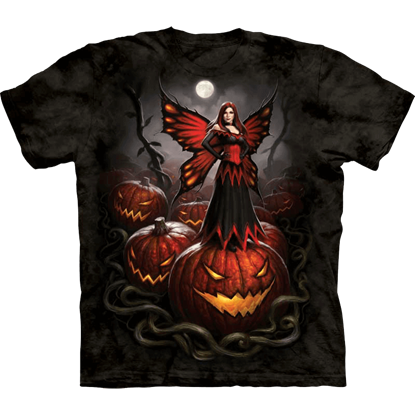 The Anne Stokes Immortal Flight T-Shirt finds the perfect balance between fantasy and gothic art. 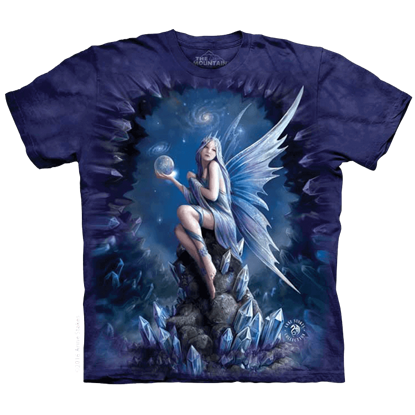 Even fairies can use their own peculiar magic, just like the one shown in the graphic of the Anne Stokes Mystic Aura T-Shirt. This butterfly-winged fairy wears a pentacle tiara and floats a transparent glowing ball above one hand. Within a moonlit glade, who knows what mystical things you might see? 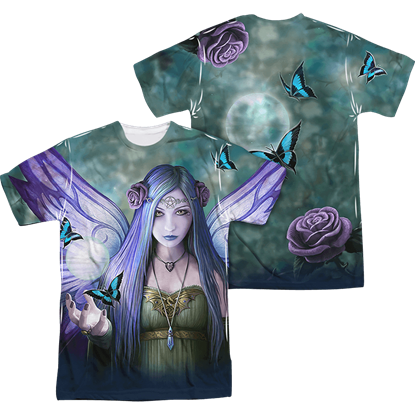 The Anne Stokes Naiad T-Shirt displays a lovely water nymph with violet butterfly wings spreading out from her back as she kneels before a pool of water. 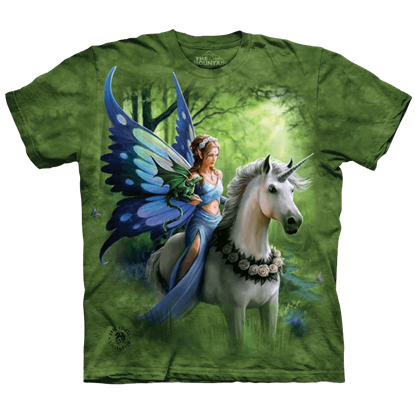 On the Anne Stokes Realm of Enchantment T-Shirt, a trio of mythical beings enjoys a peaceful stroll through a magical forest. With a tiny green dragon perched on her arm, a butterfly fairy rides comfortably on the back of a unicorn. The careful guardian of her flowers, this dark fairy braves even the stormiest nights to watch over her roses. 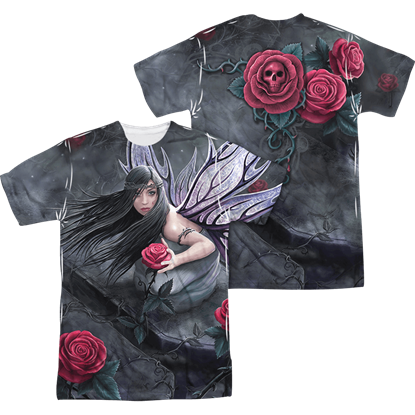 The Anne Stokes Rose Fairy T-Shirt displays a violet-winged fairy as she holds out one of her perfect red roses. Holding high a crystal ball, the moon fairy gazes at the crystals that line the cave. Surely their gleaming figures remind her of the stars. She observes their similarities in the scene featured on the Anne Stokes Stargazer T-Shirt. Are you looking for something dark yet decadent to wear when it comes to gothic style? Well, look no further, because in this Arachnafaria Lace Up Long Sleeve Womens Shirt, you have a gothic garment that is worth celebrating. Often jubilant and carefree, fairies are rarely a lonely lot, yet it does happen. 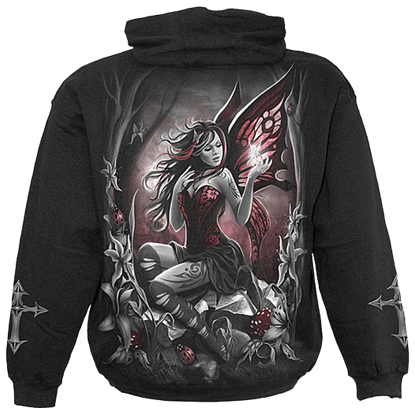 This woodland fairy finds companionship in the magical, moonlit scene that is this Companion Hoodie, and she finds it in a pixie like herself. Jubilant and carefree, fairies are rarely lonely, yet sometimes, it does happen. This woodland fairy finds companionship in the magical, moonlit scene that is this Companion Long Sleeve Shirt, and she finds it in a pixie like herself. Jubilant and carefree, fairies are rarely lonely, yet sometimes, it does happen. 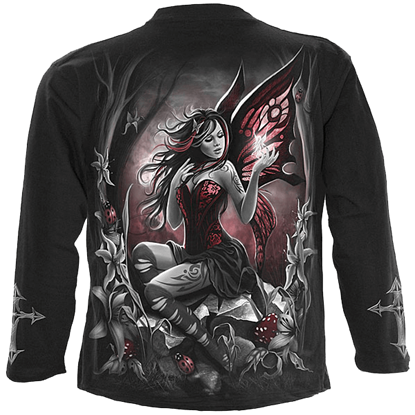 This woodland fairy finds companionship in the magical, moonlit scene that is this Companion Long Sleeve T-Shirt, and she finds it in a pixie like herself.